You take the celluloid-boxed corsage from the refrigerator; carry it to the bathroom, where the dress you'll wear this evening hangs behind the door; sneak a quick look at your excited, happy, glowing face reflected in the medicine-cabinet mirror; pull a loose thread from the collar of your terrycloth robe; put the boxed flowers in the sink and begin to pry off the celluloid cover. Then you scream. On the petal of the perfect rose, an ugly, deadly black widow spider is waiting. Waiting there for you. You fling corsage and spider to the floor and jump into the stall shower, sliding the glass door closed. The spider can't get at you now. Off comes your robe and you turn the water handles marked "hot" and "cold." Instead of a tingling shower spray, noxious streams of deadly gas pour down. Gasping and coughing, you try to turn it off. Impossible. You slide back the glass door and start to step out. But, no, somewhere on the floor is the black widow spider. Then you see the rose -- blackening, turning to ashes on the tile, and there the spider too, shriveling into a burnt cinder -- and you realize that if you step out of the shower onto the floor, you, too, will be instantly electrocuted. At this moment, probably through the hot air vent that heats the room, a suave but soothing male voice says, "This is Napoleon Solo, Agent 11, the man from U.N.C.L.E. Illya and I are here to save you. Quickly now, put on your clogs. They're rubber and will insulate you from the electroporous grating of the electrostatic floor." Trustingly, automatically, you do as he commands. Carefully you step onto the tiles, slowly you walk toward the bathroom door, gingerly you detour past the ashes and cinder, finally you reach your goal. You turn the knob. Locked. Behind you in the shower the deadly gas hisses out, filling the bathroom. You scream, "I'm trapped! Why me? Who's trying to kill me? Why?" Another male voice filters through the heating vent -- friendly, consoling, sustaining. A voice with a slight, pleasant Russian accent. 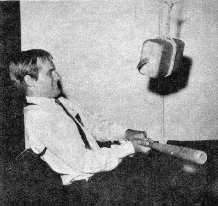 A voice that says, "This is Illya, Illya Kuryakin. Don't be afraid. Squeeze up against the wall. Away from the door. We'll shoot it open." Again you follow orders unquestioningly. Then you hear the sound of submachine guns bullets splatting into the lock. Nothing happens. It's bullet-proof. The sound of two shoulders thudding against the door. Nothing. It's shatter-proof. Silence. The room spins, your knees turn to jelly, you feel yourself sinking towards the electrostatic floor. Solo's voice again. Strong, insistent. "Don't give up, Miss. We'll get you away from THRUSH yet. I promise you. Now, concentrate, keep calm, is there a match somewhere in the bathroom?" "Yes, yes," you reply. "On the table next to the sink." "Good. And shaving cream? Not in a tube, but the kind that squirts out of a can?" "Yes, my father's. In the cabinet." Illya's voice breaks in excitedly. "And... and... is there any after-shave lotion?" "Yes," you whisper, as you feel the poison gas gradually seeping into your nose and creeping past your lips. Then there are only the voice, Solo's and Kuryakin's, telling you what to do; and your two hands, manipulated by their voices as if by strings, carry out their instructions. You take the shaving cream container from the cabinet (it does feel like a bomb), wrap it in a towel, wedge it against the door, sprinkle the towel with after-shave lotion, light the tail of the towel with a match, step back quickly, cover your head with your hands and crouch down under the sink. Flame consumes towel tail, blazing lotion heats shaving cream and br-ooom --- a volcanic explosion of can and cream knocks down the door. You stagger out, laughing and weeping, overjoyed to be alive. 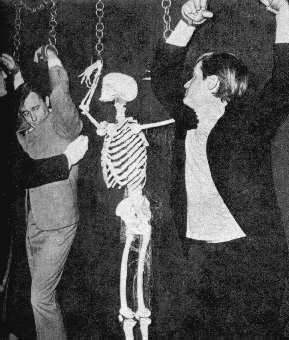 And there, each waiting with open arms to embrace you, are Napoleon Solo (alias Robert Vaughn) and Illya Kuryakin (alias David McCallum), the men from U.N.C.L.E. A moment ago you were almost dead; but what matters now, crazily, is that you look a mess (what girl wants shaving cream on her face?) and you'd like to straighten your hair and fix yourself up and put on a pretty dress. And then forget how THRUSH and gas and black widow spiders an impregnable doors in the safety and snugness of a man's arms closed around you. But they're waiting for you now. Who will you turn to? David McCallum? "Hello. I'm glad you're alive," he says. And you realize his natural accent isn't Russian, but Scottish -- with a soft, attractive burr. His blond, rumple hair falls every which-way over his forehead, as if he combed it with an egg-beater. You suddenly remember having read somewhere that when he was accused of imitating The Beatles, he laughed and replied, "The Beatles have a McCallum cut, actually. Not vice versa. I've had mind for eight years." You notice the dark shadows in the valleys of his pale, pensive, narrow face. But now, magnetically, you are fixed an fascinated by his brooding, intense blue eyes. You break the spell by trying to figure out of whom he reminds you. James Dean? Yes, the same caged-animal appeal. Rudolph Nureyev, the Russian ballet dancer? Yes, the same physical grace. 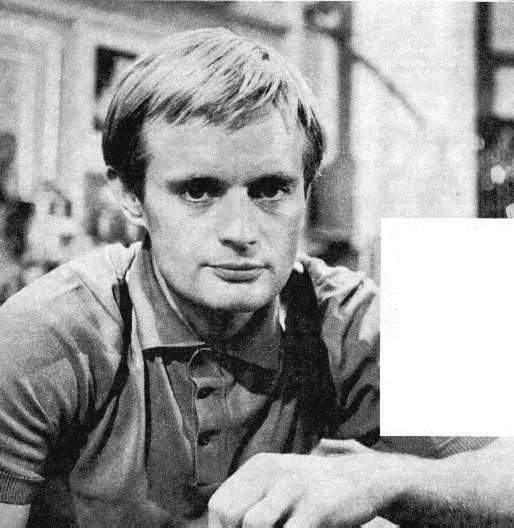 but now his eyes call to you again (I'm me -- David McCallum. Myself) and his arms beckon. 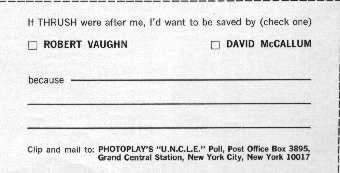 David McCallum or Robert Vaughn? Which man will you go to? Whose arms will you choose to protect you from the evil menace of THRUSH? 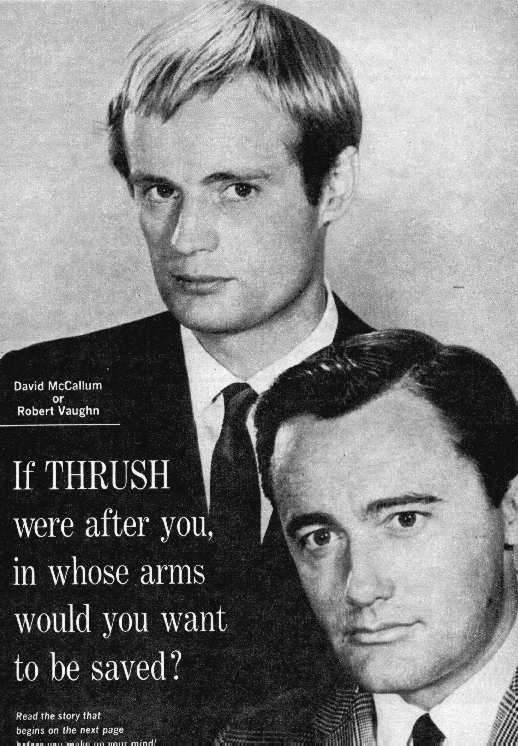 But suppose that after they save you from THRUSH you had run into David McCallum's arms instead of Bob's. Well, as soon as you'd prettied yourself up, he'd whisk you off to his four-story, eleven-room Spanish-style house (also in the hills above Hollywood.) There, in the spacious living room, you relax in a deep, comfortable chair -- he perches boyishly on a footstool at your feet, and the two of you get to know each other. Conversation is very important to him. "Talking without interruption or distraction is one of the most enjoyable things in life," he has said. So that soon, warmed by his enthusiasm and touched by his sincerity, you find yourself discussing what he calls "basic things -- belief, the subjective approach to religion," important subjects. David draws you out and you discover that with him you can talk about anything. He tells you that he doesn't go for classical music (probably because his father, former concertmaster of the London Philharmonic, and his mother, formerly a professional cellist, tried to train him to be an oboist until he broke away at fourteen to become an electrician in a British theater), but that he really digs European motion pictures ("I like foreign films and see all the ones released here"). then zowie -- he changes the subject. "You know," he says, "it's not safe to swim in fresh lakes anymore. Anywhere. All the lakes and fresh water streams are filled with flesh-eating Piranhas." You start to interrupt but he goes on. "It's true -- don't argue -- it's a fact. Small boys have been bringing them home. Mother won't tolerate them. So, what does the little brat do but throw them in a nearby lake or stream. Well, anybody know what happens when two Piranhas get into fresh water together -- within no time at all you have a lakeful." You believe him -- and your face turns white. Believe him until you see the impish smile fan out from his attractive lips. then, instead of cuffing at him for putting you on, you feel like leaning forward and finding out how his rumpled hair feels under your fingers. You restrain yourself -- and change the subject by asking what it was like playing Judas in "The Greatest Story Ever Told." 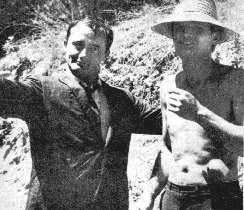 David begins to answer jokingly by saying that during the filming of the picture he addressed Max Von Sydow, the actor who played Jesus, as "Max Baby," and that Von Sydow, in turn, called him "Judas Baby." Then, mercurially, he changes mood and seriously explains his conception of the Judas' character. "How many times has a man been betrayed by someone he thought was his best friend? That is the way we played it." Although man betrayed Jesus in the past and is betraying his fellow man in the present, David has great faith in man's ability to learn and to change. "I believe mankind is evolving toward a fantastic future. Someday, God knows how many thousands of years from now, mankind will look back at us and ask, 'What was that?'" You lean forward enthralled, but then his eyes darken and he warns you of something that may bring about the end of all mankind before we have a chance to evolve toward a fantastic future. Not global war. Not nuclear destruction. But the alligators. "No I can't guarantee it's true, but kids have been bringing home baby alligators and flushing them down the john," he reveals. "Can you imagine being a new man in the sewer department and going down there for the first time and running head-on into a full-grown alligator? You know a sewer is the best. place for an alligator to survive. It's alligator heaven." But just suppose one wise old alligator discovered how to tip up a manhole cover and, one night, led the others out? You gasp. But of course he's just putting you on again. You don't know whether you want to kill him or kiss him, and when you've just about decided that you'd rather kiss him, he jumps up impetuously and says he has a surprise for you. The surprise turns out to be a pretty woman named Jill, whom he introduces and his wife, and his three little boys -- Paul, six, Jason, three, and Valentine, two. You're flabbergasted, but after the ice is broken and David and Jill begin telling you how he fell in love with her (he saw her picture in a newspaper -- she was a ballerina -- clipped it out and kept it in his wallet) and how she fell in love with him (she said "yes" when he proposed less than a week after they met and they were married before the week was out, you can see how happy they are. Paul, Jason and Valentine all try to climb onto your lap at once. Paul kisses you. So does Jason. And Valentine. Jill corrals them and they shout "good night" and blow kisses at you as she carts them off to bed. "They all want to kiss me," David says. But it's immediately apparent he's not talking about his children, but about his fans -- girls who wait in ambush behind trees, shrubs, gate-posts, buildings, doors and cars to dart out and kiss. "They all want to kiss me," he repeats. "If my wife's along, they ask her if they may. Funny, they never ask me." You decide to ask him. You close your eyes, count up to ten and try to imagine that Jill and the boys were never in the picture and that you and David are the only two people in the world. When you open your eyes, he's there -- irresistibly impish, awfully attractive; but when you open our mouth to ask, the words just won't come. The image of Jill and the kids refuse to fade, darn it; then surprisingly, you find you're kind of glad, somehow, because you like them, too. And, because, you'll never forget the shivery, special thrill you had when you ran to him and first felt his arms close around you. Those other girls, the ones who kiss without asking, will never experience that.